Chatbots, you’ve probably heard the term. The latest IoT buzzword is one of the hot topics trending online and with good reason. With over 18,000 chatbots in existence, they are quickly becoming one of the newest, most widely used applications for AI. According to Gartner, by 2021, more than 50% of enterprises will spend more each year on bots and chatbot creation than traditional mobile app development. As stated in their recent blog post, Gartner Top Strategic Predictions for 2018 and Beyond, “Individual apps are out. Bots are in.” So, exactly what are chatbots and why should you care? 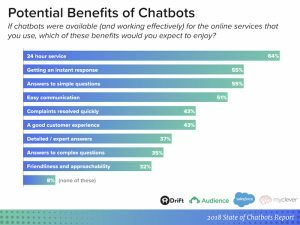 Similar to other types of automation, chatbots are seen as technologies that free up time for humans to focus on less repetitive, higher-value tasks. A chatbot is defined as, “a computer program designed to simulate a conversation with human users, especially over the Internet.” In simple terms, it is a bot that can have a conversation with a human. 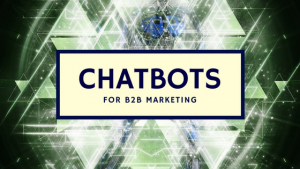 While up to date, chatbots have mostly been used in the B2C arena, there is also a strong case to consider them for B2B. If your business is running a lead nurturing campaign, there is a good chance that they can easily be converted into conversational interactions through a messaging channel. By using a chatbot, you can automate question answering and make it happen automatically. At the top of the funnel, a chatbot could be used to answer prospects’ questions. Or, a chatbot could assist a prospect’s search for a perfect solution by directing prospects to a specific product based on data provided by that customer. Speed and efficiency, two things businesses are always striving to optimize. With chatbots, a business can have both. Chatbots can be integrated into an employees’ workflow as a personal assistant. The bot can assess large data points and integrate them into CRM systems in a matter of seconds, rather than an employee having to take the time to do all of this manually. This frees the employee to focus on higher level tasks. Chatbots are becoming more advanced and are being adopted by B2C and B2B alike. The benefits of using this new technology to streamline business workflows are paramount. In the foreseeable future, bots will be handling many of the communication tasks once done by humans. So is a chatbot right for your business? It may be time to see what a chatbot can do for your business goals.